Lighting the back of your iPhone's Apple logo is priceless, and now everyone can do it themselves in just five minutes. Much like replacing the rear glass panel mods that everyone by now should be familiar with, K.O Gadget's $43 Luminescent Logo Mod Kit will let you replace your iPhone 4 or iPhone 4S' original black or white rear panel with an identical modded one that has a transparent Apple logo and a special thin light panel which will illuminate your Apple logo as if it were a MacBook Pro. Unlike the iPach mod that required you to send in your iPhone, the Luminescent Logo Mod Kit is easy enough for a DIY with the help of a detailed instructional video. The light panel which serves as the Apple logo backlight plugs into the iPhone's screen to get its power and is said to not impact battery life nor add any bulk. Every time you turn on the screen, receive a notification and even talk on your iPhone, the back Apple logo will light up just in time for the holidays. The mod is fully reversible in case you need to use your warranty so no harm done. There's only 35 hours left to grab a kit until Apple takes down this operation. Head over to the product page for more details. It's only a matter of time until eBay sellers get in on this. iFixit always prove to be very helpful when it comes to taking apart your electronic gadgets to fix them up or just for fun peeking around. This time iFixit posted up their teardown of the Apple Thunderbolt Display to reveal some very interesting guts you would never have thought to find in a display. Head over to the teardown page for the full procedure filled with useful information and detailed step-by-step teardown of Apple's 27" Thunderbolt Display. Here's a great little add-on for those of you who don't take it so kindly on those white USB sync cables of yours. MySaver are little colorful protection shields with one mission, to protect and extend the life of them fragile iCables. And they also perfectly match the Smart Cover colors too. The MySaver cable protectors are made out of aluminum and flexible colored silicone and help prevent the problematic area of the cable from ever fraying and coming apart due to heavy use, or misuse. We're not going to judge. Apple's USB sync cables run for $19, while the MySaver Pro comes fully-assembled on a OEM quality replacement Dock Connector to USB cable and it will set you back $24.99. You can always get adventurous by going with the MySaver DIY kit for much less at $10.99 and add it to your own cable. You can pre-order both the MySaver Pro and MySaver DIY right now at pre-order prices at Kickstarter. Still stuck with the original iPad but you just wished you could use that Smart Cover? A simple mod that requires a little bit of gluing a few magnets to the side of your iPad will make your wish come true. The downsides to this are that your iPad will not automatically lock and unlock by the Smart Cover since only the iPad 2 had built-in magnets that act as a sensor. A MacRumors member decided Apple's color selection of the leather Smart Covers for the iPad 2 were not to his liking, so he decided to create his very own custom color. He used a tan leather Smart Cover and treated it with simple leather oil to darken the color and give it a more traditional brown leather look, just like in the Wild Wild West. Milliamp is gracious enough to offer free petalobe screwdrivers to let you tinker away on your iPhone 4. Apple switched away from using regular Phillips screws on the iPhone 4 and now ships iPhone 4s with the new and very tiny 5-star pentalobe screws. The blue pentalobe screwdriver above is the one you're going to get for free, shipping will cost you just $3, not bad considering this exact screwdriver goes for more on eBay. A few week ago I posted about an iPhone 4 modded with clear back and front glass covers but the problem was you had to use a paint thinner or some other way to scrub off the original black paint off of your iPhone 4's original part. That isn't something you would want to do surely. A company called Sw-Box now sells these clear back glass covers for the iPhone 4 for $18.75 a piece. That's not a bad price at all. 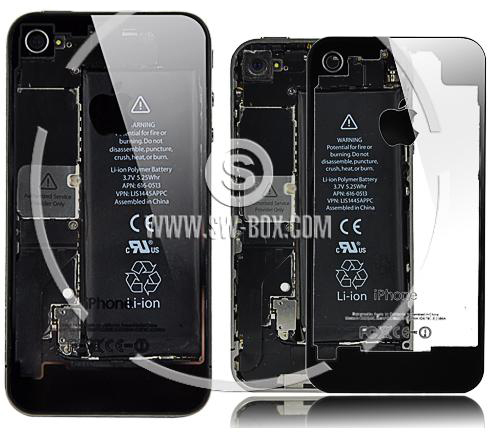 Sw-Box claims their clear back glass covers for the iPhone 4 have metal mounting tabs just like the original iPhone 4 glass cover to screw in the bottom two screws and should perfectly fit your iPhone 4. And I thought these will show up on eBay first.